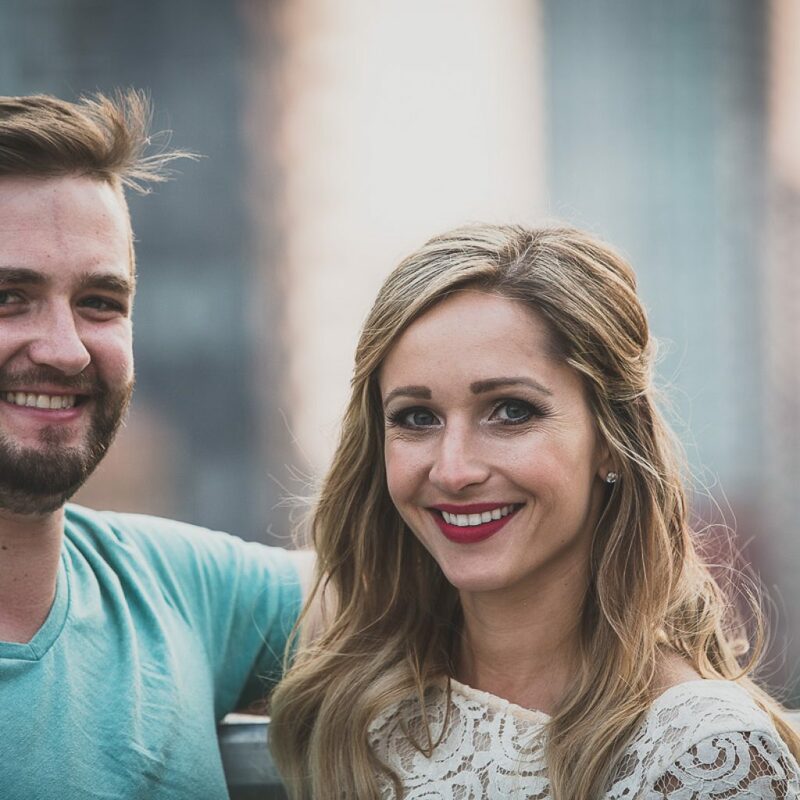 Jessica and Eric met while they were both working at National on 10th, an integral part of the beer scene in Calgary. One night after work, the staff went out to party. 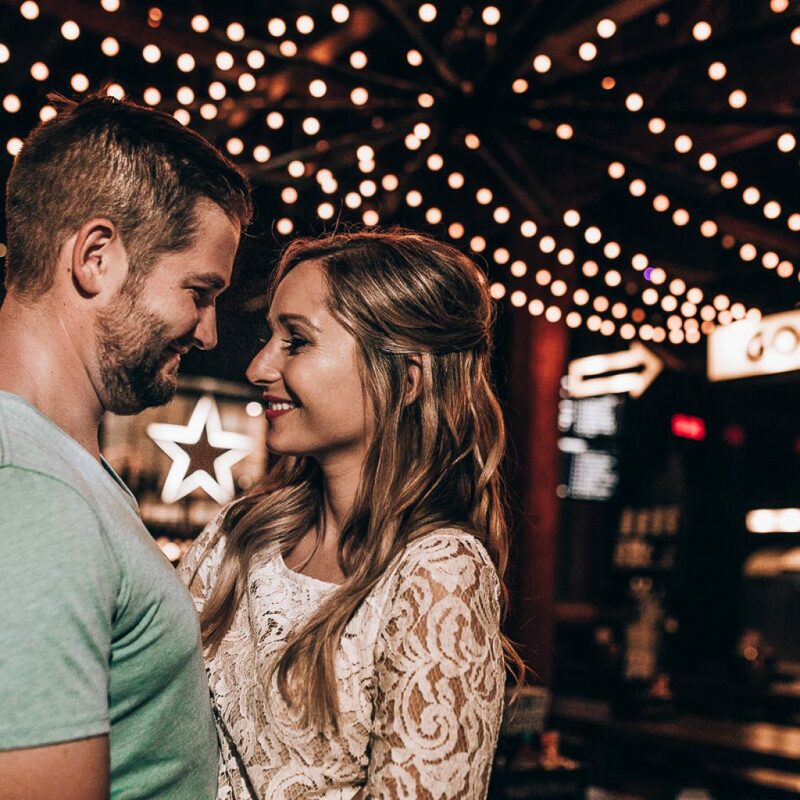 While they were out, Jessica and Eric hit it off, and their relationship slowly developed, until the two were officially dating. Around Valentine’s Day, the couple was meant to take a holiday in the mountains. 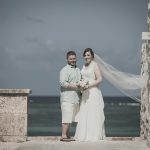 The weather had other plans, however, and a snowstorm blew in, grounding Jessica and Eric in Calgary. So instead, they went out for a nice dinner. Jessica had a sense that the proposal was coming – they had searched for rings together shortly before. However, she didn’t know that after showing him her favourite ring, a white-gold with a solitary diamond, he snuck back into the store and put a deposit on it that same day. After returning home from dinner, Eric ran into the house and locked Jessica out, a joke they play on each other to reach the bathroom first. But, he was actually running up to get the ring! When she opened the door, he was down on one knee, proposing with the white gold solitaire ring! The day began at Fish Creek Park, where the dark clouds brought rain. We waited for the rain to slow, and in the meantime wandered to a gazebo next to the Bow Valley Ranche. 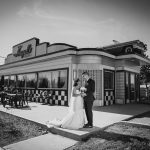 It was a great place to start the photographs, adding to the Bohemian vibe the couple was aiming for. Jessica had extensions put in for the session, and Christina Kemp of Modern Makeovers had given her the perfect boho style. From the shelter of the gazebo, we headed out into an open field. Jessica and Eric joked about creating something reminiscent of the American Gothic painting; a more serious tone. So, we set up in the field, the two standing side by side, sombre expressions on their faces. The tone didn’t last long, however, and both of them broke into smiles. 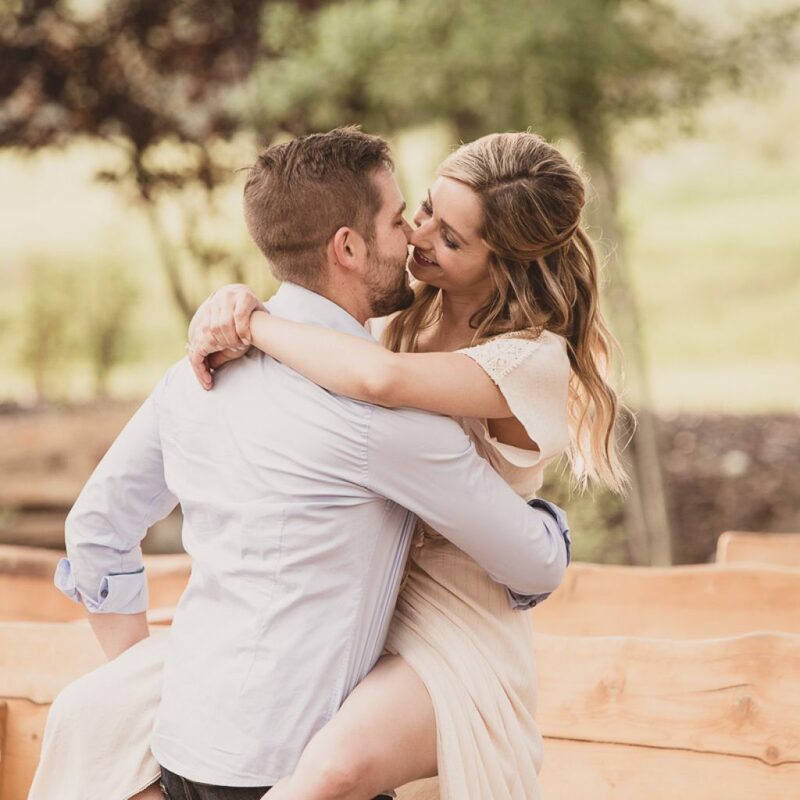 Eric and Jessica have a very natural ease around each other, so we let them move around and photographed them in a more ‘candid’ way. 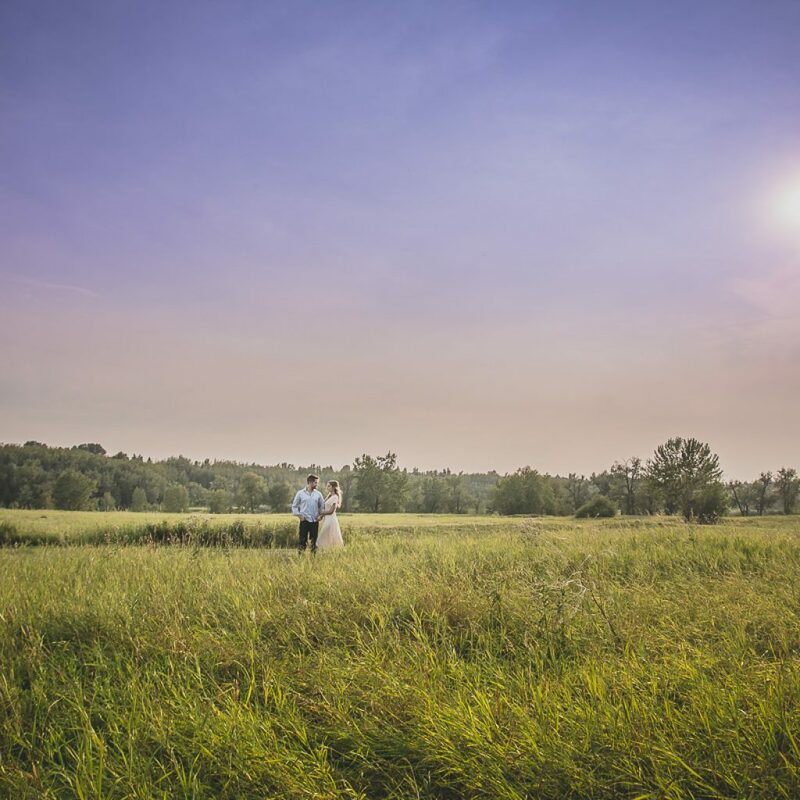 We rounded out the Fish Creek Park portion of the day with the two dancing in the fields under a clearing sky. From Fish Creek Park, we drove downtown, parking in a garage across from National on 10th, the popular beer hall where Jessica and Eric first met. The garage was under construction, with some repairs being made to the upper deck. This meant that there were no vehicles, which was perfect for our purpose! There was a big open area with very little construction equipment, so from our private garage we had open views of the Southwest side of downtown Calgary. 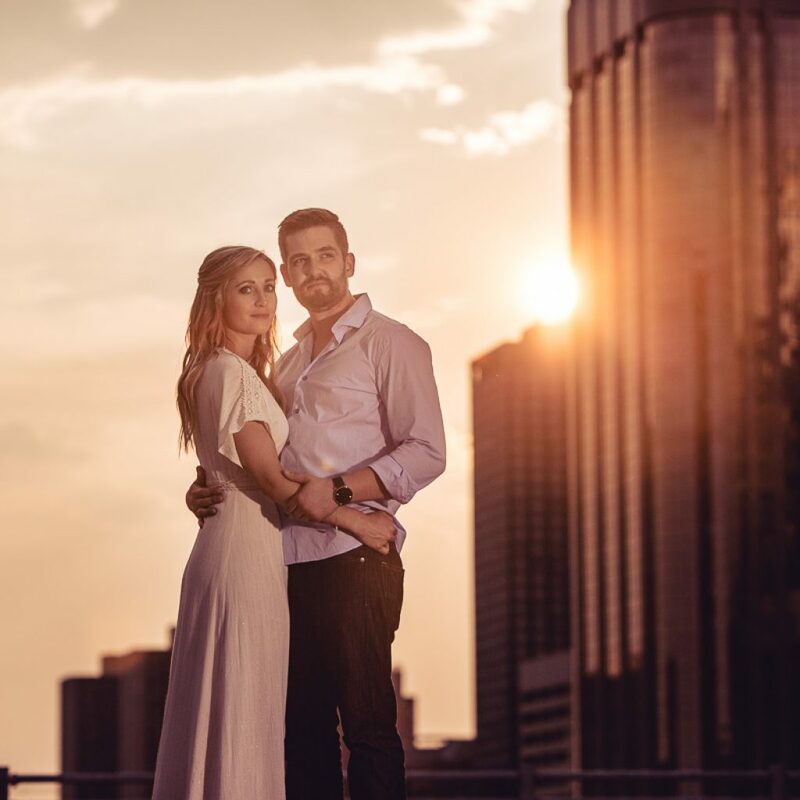 We used the skyline as a backdrop, throwing in a bit of flash to highlight the couple. Then, the sun peeked out from behind the buildings, lighting the whole area with a warm glow. 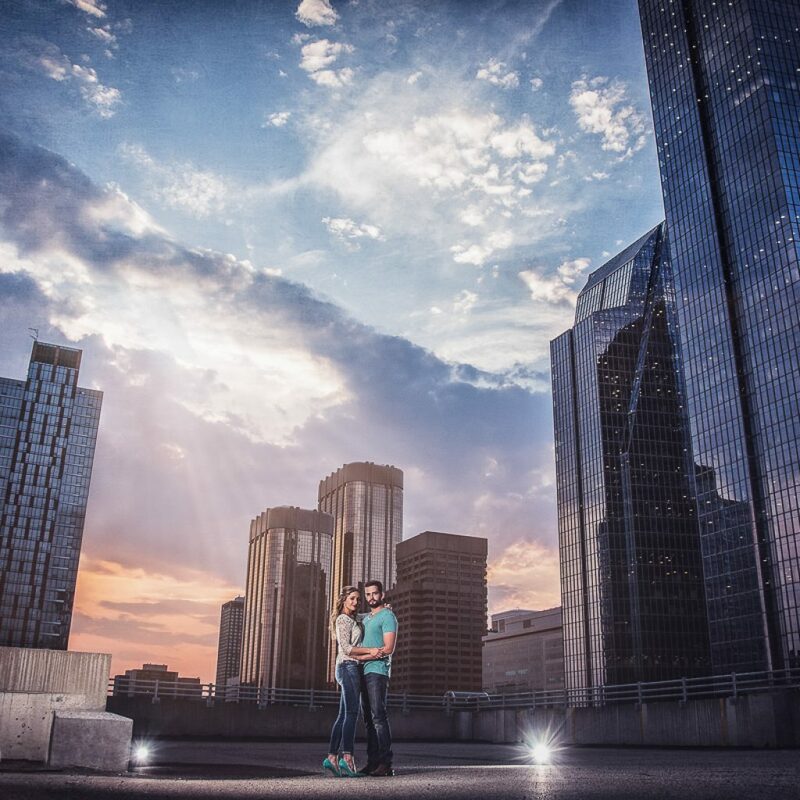 Jessica and Eric climbed onto a short wall, giving the illusion that they were standing on top of the city. 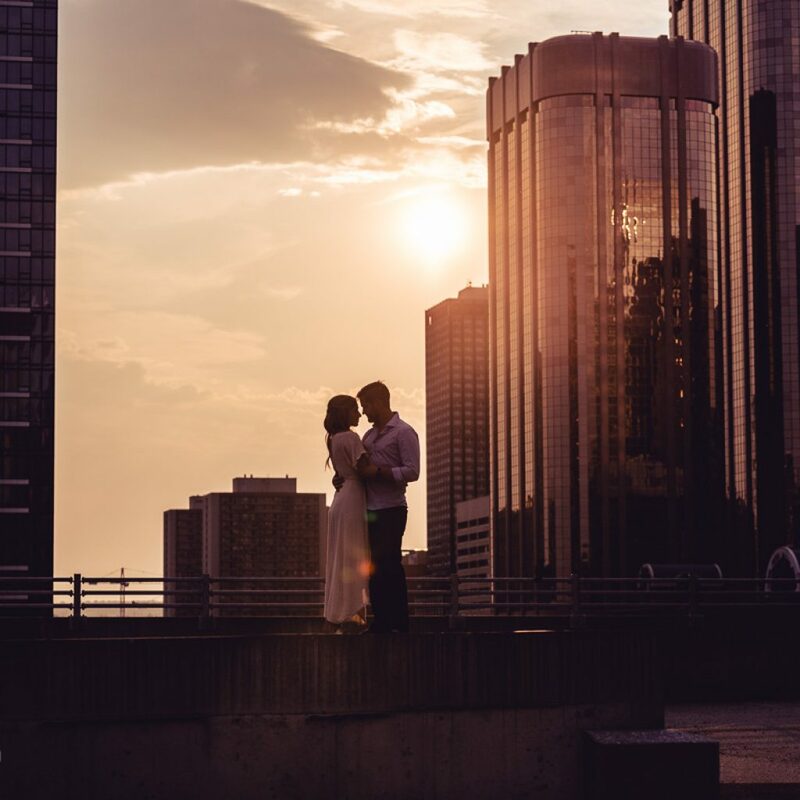 It was an incredible moment, and as the sun set, we captured some stunning images! When we had finished in the parking garage, we headed down to National on 10th. It was a fitting place to end the session, as it is such an important part of their history. Not only that, but the interior is stunning. National is a Calgary institution, with four locations across the city. The first beer hall opened on 17th ave, expanding to the 10th avenue location and adding a bowling alley and a Bourbon Room to the uniquely Calgarian experience. 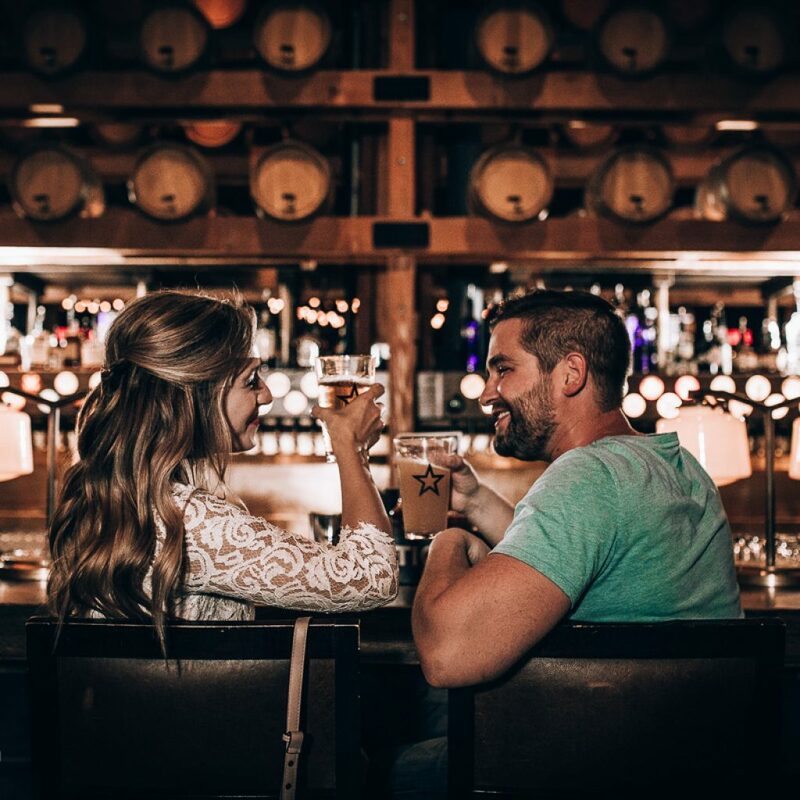 With long communal tables and hundreds of beers available, it is clear to see why Eric and Jessica love the place! 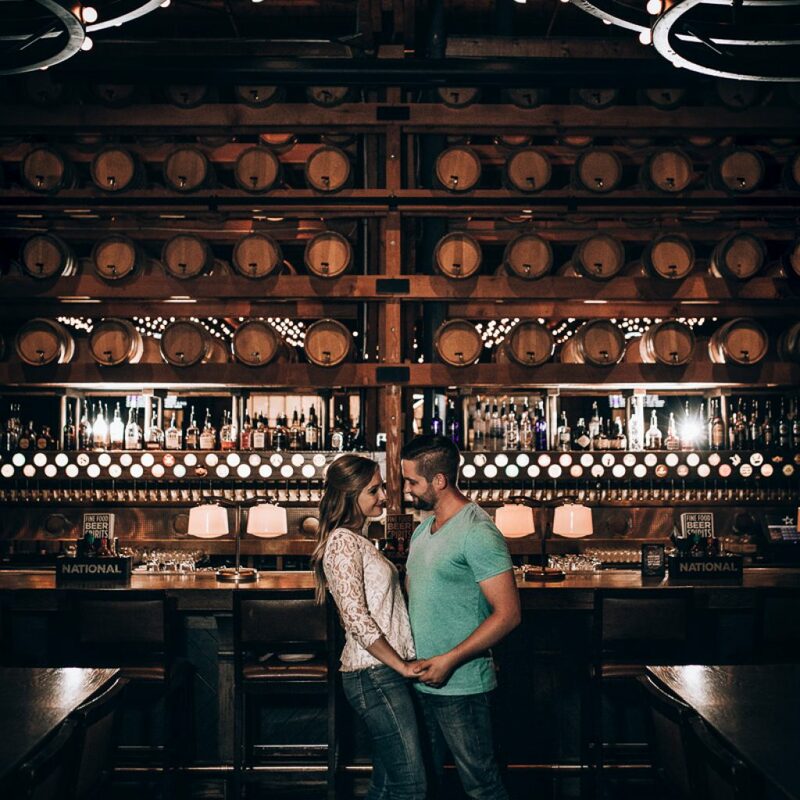 We photographed them against the main bar, which has a massive keg wall – a great backdrop! Moving to another bar, we photographed them against the large star logo, a part of National’s brand. Overhead, hanging lightbulbs gave a magical, romantic ambiance. To wrap up, we photographed the ring along the bar grates, and in a reflective pint glass. We ended the day with a pint, a relaxing finish to an awesome session!